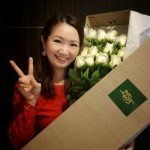 FARM Florist Singapore has experienced florists to curate a good variety of hand bouquets that are suitable for any recipient and occasion. 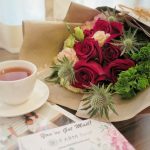 They also provide free next day flower delivery to all parts of Singapore. Many Thanks to Farm Florist (farmflorist.com) for the lovely contemporary with elegance hand bouquet. Filled with my favourite Fresh Red Roses and Eustomas. What is the first thing comes to mind when you think of Christmas? For me, it is CHRISTMAS TREE! After having my own place, every December I will have the same thoughts. 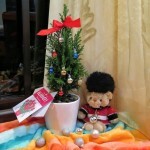 Shall I get a Christmas Tree for Christmas Celebration? It feels so heartwarming as it encourages some family quality time in the process of decorating it too. Many of my friends use fake Christmas trees as they are often durable. However, the thought of storing it in a proper place and ensures that the tree retains its original shape and style is very daunting. Hence, after many years, I still did not get a Christmas Tree. Many Thanks to A Better Florist (abetterflorist.com) for making my wish come true. Now I have an adorable Mini Christmas Tree for my Christmas 2016 Celebration! Christmas is in the air!~ Xmas Lighting is up. The Season of Giving is here! People are starting to shop for gifts for their family, friends, and colleagues. Some people might be too busy with work commitment as the year drawing to an end. Online shopping becomes one of the great options. Let your fingers do the walking and you can do it in the comforts of your home and they are available 24 hours a day, 7 days a week for you. Many choices for a Christmas gift (Jewellery, Chocolates, Accessories, Wallets, Ties, Body Lotions and etc). 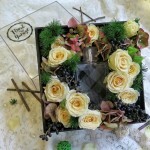 A beautiful Floral Gift Box by Floral Garage might be a perfect gift for your loved one.